How do I set up the Delivery Calendar? 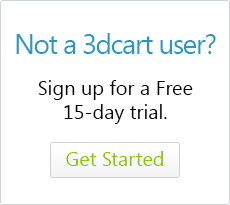 3dcart's Delivery Calendar App add-on will display at checkout and allow your customers to choose when they would like their items delivered. The date they choose will then display in the invoice for easy processing. Settings such as blackout dates, buffer dates, and available dates viewable are included with this App. When you purchase the Delivery Calendar App from the 3dcart App Store (and your order is processed and completed), you'll receive a notification from your project manager advising your that the app has been installed and ready to use. Once you receive that email, these instructions will show you how to set up the app. Please note that the Delivery Calendar app does not work on non-responsive themes. The Delivery Calendar App is installed on your store as a module and contains a few settings you'll first want to configure. Once the module appears, click on "Change Settings"
Use this field to specify the maximum number of selectable delivery days that the shopper will see during checkout. For example, writing 30 in this field will give the shopper a calendar view with a time range of 30 days to choose from. Use this field to specify the number of days (from the date of the order) that will not be selectable on the calendar. For example, writing 3 in this field will make it so that the shopper can only select delivery dates that are 3 days after their order date. This is intended to allow you time to prepare the order and ship it. This calendar inside the settings will let you select dates that you want to disable for delivery. For example, holidays and other special dates. Simply click on the date in question and it will be blacked out on selector calendar viewed on the store's checkout page. The delivery calendar app uses your store's existing Checkout Questions function to display the date selector onto your checkout pages. When it is installed, a new checkout question type - Calendar - is added to the store. Simply set up the question as needed, and your customers will use it to select their delivery date. Use this drop down menu and select "Calendar"
Select this if you'd like the function to work for customers who are not yet part of a group. Select this if you'd like the function to work for a specific customer group. Use this to provide a title for the function. For example, "Select when you'd like to have it delivered" or something similar. Select the step in the checkout process when the question will appear. If you have multiple questions that you're asking at checkout, specify the sorting for the calendar function within the list. Higher numbers will make it appear further on the list. This is not used for the calendar app. This is also not used for the calendar app. Once you have configured the settings to your needs, click on the "Update" button to complete the process. When the app is configured, your customer will see the delievery calendar question field on their checkout page. When they click within the field, a calendar will appear allowing them to select their desired date for delivery. Furthermore, when the order is placed, you will see the selected date in the order's checkout questions.